Oracle APEX Developer of the Year… It’s official! It was a really interesting experience! I had to give an interview and they sent Ton Hendriks, a professional photograph from the Netherlands to take some pictures. Like John wrote, it was a little bit surreal. We took some pictures at my workplace and then we went to the Naturhistorisches Museum of Vienna to take some outdoor pictures. So I was posing in this public spot, sweating because it was a really sunny day and a photographer was lying on the ground and taking pictures of me. So you can imaging how the tourists looked when they walked by. 🙂 Too bad that there is no PDF version available of the Oracle Magazine, because the HTML version doesn’t show the picture. I have seen the picture and I think Ton did a really good job! 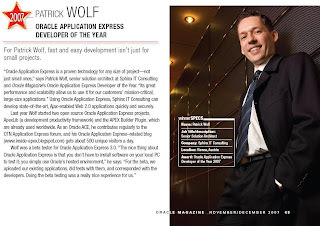 Thanks again to the Oracle APEX development team for nominating me. I really appreciate that! A big thank you goes also to Sphinx IT Consulting for supporting me in my open source and community efforts. You don’t know what Oracle Application Express (APEX) is? Check out apex.oracle.com! Update as of 23-Nov-2003: Added the picture from the Oracle Magazine. Congratulations Patrick, very well deserved! Congratulations – You are a very worthy winner with all that you have given to the APEX Community and the development team. Excellent. Keep on continuing for our pleasure. If you don’t mind I’d even give you the ‘best partner’… Cons! Congratulations with your well deserved title! Keep on working with your inspiring Apex improvements. Well done Patrick, it is definitely very well deserved. Thank you for your comments and support on my blog, it is very much appreciated. I have made it a habit to visit your blog every day. Many congratulations Patrick! …and very well deserved too – your site is a mine of useful and interesting information. Congratulations Patrick on a very well deserved honor! Congratulations Patrick – very well deserved indeed. Keep up the great work! Congratuatlions, Patrick! Very much deserved. Thanks for all of your many contributions to Oracle Application Express and the APEX community. can you believe that i found out such great news only now??? It must be because i’ve been away for a while, anyway i’m sure that you absolutely deserved to win. Could you pls help me for oracle apex application. Actualy, i’m unable to generate a image file through apex application. after doing above activity,i’m getting no data found. pls give me resolution of above problem.